In the autumn of 2014, umbrellas instead of traffic filled the main streets of Hong Kong. The Occupy Central movement that lasted for 79 days was a testimony to how much Hong Kong people, mostly youths, were growing frustrated with Beijing’s increasing bossiness. After Britain returned Hong Kong to China in 1997, Hong Kong has been under the ‘one country, two systems’ doctrine and therefore enjoyed semi-autonomy; it had its own mini-constitution and legislative council, which was partially democratically elected. What’s more, Beijing even promised at the time that in 2017, it would allow Hong Kong to democratically elect its top leader, Hong Kong chief executive (HKCE). But of course, until then, the HKCE was to be elected by a pro-Beijing committee. If only it were true. In August 2014, Beijing severely restricted the democratic nature of the 2017 election by saying that only a select number of candidates approved by a special committee could run. The news, unsurprisingly, was not met very well. The Occupy Central movement opposed this authoritarian behavior of the Beijing government and through peaceful protests and sit-ins the protestors demanded that Hong Kong is allowed a ‘truly’ democratic election. Despite all this, Beijing remained resolute and Occupy Central gradually dissolved without any real achievement. However, the seeds of protest and radical political reform have already been sown. After Occupy Central, the core youth leaders of the movement became a new political force, namely the ‘localists.’ The results of 2016 Legislative Council (LegCo) election on 4th of September reflected their growing popularity, with localists/radicals taking 8 seats, out of which three are from the youth localists political groups (Youngspirational and Demosisto) that stemmed from the Occupy Central movement. The youngest of the three, Nathan Law, is only 23 years old. 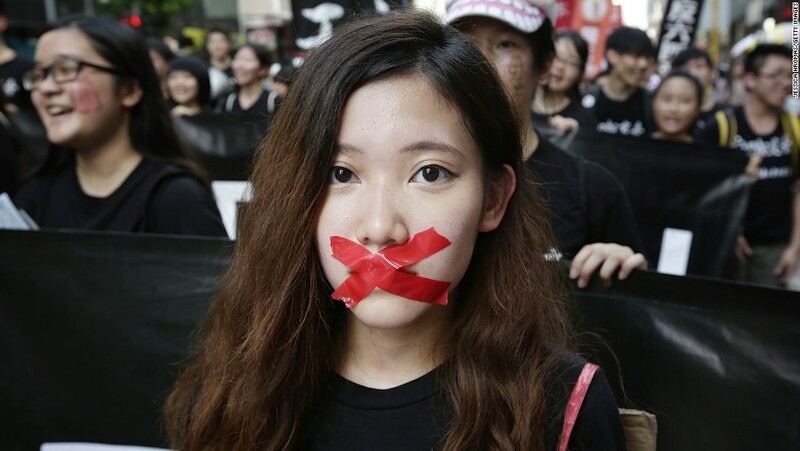 Why did Hong Kong youths suddenly jump into the political arena? Is it simply an emerging ‘popular trend’ that youths have taken a temporary liking to? Or is it a genuine start of what some candidates call ‘revolution’? To understand why Hong Kong youths have suddenly become a headache for the Beijing government, we first need to know the region’s identity. Despite its current status (as a part of mainland China), Hong Kong people have always differentiated themselves from the Mainland Chinese. For one, they speak Cantonese, not Mandarin, and they enjoy more political freedom than the Mainland Chinese people. After all, less than 20 years have passed since Hong Kong was officially returned to China- not enough time has yet passed for Chinese culture to tint the region completely red. Freedom and individuality are inseparable. Without freedom, there can be no individuality; in the end, it is only when you can determine for yourself what you wish to be that you can confidently say that you are an ‘individual,’ not a pre-programmed android. What Hong Kong youths demand is not a nominal democracy, but the freedom to choose their identity. This is why when you look through their lens, Beijing is inevitably seen as an oppressor- it is taking away their liberty to be who they are. It is not a choice between democracy and communism; it is a choice between keeping and losing their unique identity. *Photo Credit: CNN, (2014). Hong Kong Occupy Central. [image] Available at: http://i2.cdn.turner.com/cnnnext/dam/assets/140611050938-hong-kong-white-paper-horizontal-large-gallery.jpg [Accessed 15 Sep. 2016]. It can be a little intimidating (not to mention annoying) when your brother is constantly plotting to kill you and makes a no secret of it. After all, you’re living under the same roof, and you never know when he might actually carry out his ‘grand plans.’ If he occasionally makes a show of chasing you around with his knife, it would indeed be natural for you to seek some measure of self-defense. Well, that’s what’s currently happening in the Korean peninsula. Only, while one parent insists that you should be allowed some ways to defend yourself, the other insists that such measures will destroy the family relationship. On February 7th, United States and South Korea began official discussions on deploying the Terminal High-Altitude Area Defense (THAAD) system on the Korean peninsula. Talks about deploying THAAD has been ongoing in the background for some time, but South Korean military-political leaders have been very cautious about making the decision; it was only after North Korea’s fourth nuclear test in early January and a long-range rocket test in February that President Park finally decided enough was enough. But what exactly is THAAD system? As you might guess from the name, its purpose is primarily defensive; it is a defense system designed to shoot down short, medium and intermediate ballistic missiles. No harm in wanting to shoot down a missile coming to destroy your homeland, right? Unfortunately, in the world of politics, the answer is no. When Korea and US jointly announced the official decision to deploy THAAD, China and Russia strongly criticized the act and blamed South Korea for “undermining regional stability and flagrantly damaging the security interests of neighboring powers.” The reasoning behind it is that would “undermine strategic security” of China, as it would enable US to nullify the power of Chinese nuclear missiles, giving the US a significant military advantage over China. Of course, South Korean and US military tried to persuade that this won’t be the case- you can read further about why THAAD is not a security threat to China from here. So why is China so angry with THAAD if it’s not a serious security threat? After all, China rejected the offers from the US and South Korea to provide a technical briefing regarding THAAD’s capabilities. This could possibly mean that the reasons for Chinese opposition to THAAD may not be purely military, but political. One of the arguments runs, China may be trying to reestablish the traditional hierarchical international order in Asia. For a long time, the Sino-Korean relationship was dominated by China, and as the regional hegemony at the time China received tributes from its ‘younger brother,’ Korea. Not only that, China often intervened extensively in Korean politics and military issues. So it’s not a surprise that there are voices of concerns that China is now inclined to treat South Korea and its relatively weaker neighbors as tributary states. They argue that the rising level of nationalism within Chinese population- a result of state-censored history education- has now inspired a revival of Sino-centrism; now that China is once again the regional hegemony, it wants more ‘show of respect’ from its neighbors. Another possible source of explanation is the tense Sino-American relationship. Despite its extravagant spending in the military, China still lags significantly behind the US in terms of its military capacity. People were caught off-guard with China’s rise; they never expected China to achieve such prosperity and power in such a short span of time. Although impressive, this has resulted in a situation where its neighboring states have had too little time to become accustomed to the ‘new China’ and the idea of Chinese hegemony in the region. Surprise yields uncertainty, and uncertainty yields fear; fears about the consequences of China’s dominance in the region have compelled many of China’s neighbors to regard China as a “source of security threat,” according to Chinese Vice FM Fu Ying. Being surrounded by hostile neighbors can make anybody nervous, especially when you have a world-boxing champion supporting them. In China’s eyes, THAAD, although not a physical security threat, is a psychological one- it is a symbol of US’s intention to contain China by strengthening US-Japan-ROK security cooperation. A third possibility may be that China is genuinely concerned about the security of East Asia. The logic is this: if South Korea and the US keeps pushing for the “radical” measures against North Korea, it would do nothing more than to upset the Pyongyang regime and act as an incentive for them to quicken their development of nuclear weapons. China’s argument is that deployment of THAAD could spur an arms race in the region, and with North Korea acting like a moody teenager, high tension may lead to armed conflict, leading to a potential war. Whatever the actual reason is, the fact that South Korea is in a difficult situation does not change; it has a crazy, moody teen brother wanting to murder it, an unhappy father that dislikes you carrying around a shield to protect yourself, and an anxious mother who’s on your side, but is away on a foreign continent. The choice must now be made- as a traditional middle power, South Korea now needs to choose in whom it harbors its security. Those who expected that a referendum would end with a sigh of relief were shocked to find out that rather, it ended with a gasp of shock. Now that some time and the initial shock of “EU without Britain” (or rather, “Britain without EU”) have passed, various media groups and journalists are trying find out why it happened. Of course, if we’re being truthful, it’s more about who than why; people are basically naming names, dividing Britain even further. The above statement has been a mantra for a majority of the British public; many believed that the Brexit campaign was a classic example of ‘class politics’, according to which your level of wealth would have either compelled you to vote leave or remain. It was mainly from this idea that your ‘class’ decides what you vote for rather than rational reasoning that caused the British society to be more divided than ever about a single issue. While a lot of working class people were vehement about the ‘elites’ based in London being the only ones benefitting from Britain’s relationship with EU, a majority of those ‘elites’ accused the working class people of being ignorant of economic consequences Britain’s exit from the EU will bring. Of course, the extent to which this alleged ‘over-competition in the job market due to EU immigration’ phenomenon is actually true is debatable. After all, it is also true that these immigrants pay taxes; in fact, they pay more than they receive. According to HMRC figures, migrant workers in Britain paid £2.54bn more in income tax and national insurance than they received in tax credits or child benefit in 2013-14. However, what this article is trying to divine is not whether the claims made by either campaign was true or false; rather, it is trying to determine whether the divisive labels given to both sides of the Brexit issue is justifiable. Is it true that the ‘poor’ voted to ‘leave’ and the ‘rich’ voted to ‘remain’? Well, the statistics tell us that it’s not that simple. The analysis of those who voted for Leave shows that 34% who opted out are in AB group (economically middle-high class). Furthermore, those who owned their homes voted to Leave by 55% to 45% while those with private rentals and with mortgages voted to Remain. (55% and 54%) Therefore, it would be an oversimplification to simply state that just because 64% of C2DE category voted to Leave, all Leave voters are from a less fortunate economic background. Yes, it is much too easy for us to draw a line and “build a wall” dividing “us” and “them,” but division never solves any problems. The need for vigorous campaign and name-calling has passed; now that the results are out and Britain has taken an irreversible step towards the exit door, it is crucial that we stop the blaming game. An intentionally pessimistic outlook due to bitterness will end up being a self-fulfilling prophecy. Britain needs to move on from the election campaign rhetoric and come to terms with reality; it is now time for them to focus on how to turn a crisis into an opportunity, rather than pointing fingers at each other as the ashes of the disaster slowly sets into cover Britain. chQuite often, the public resents the fact that politicians are all words and no actions. It is understandable since politicians have been historically infamous for having the two faces of Janus; one before the elections and one after the elections. However, it is also true that the recent Democratic National Convention proved that words could indeed be used as a powerful torch of an idea, passing on the fire from a single mouth to the hearts of a thousand. As almost every single critic agreed, Michelle Obama gave a “pitch-perfect” speech; it was powerful yet uplifting, signalling a clear break from the pessimistic and angry sentiments that the Republicans sought to fully exploit in the Republican National Convention. Arguably, the main theme of Obama’s speech was the theme of parenthood. Obama gave recurring emphasis on the fact that the election was not about power politics and grand ideologies but rather about “who will have the power to shape our children for the next four or eight years of their lives.” Aware of the current antipathy of the general public towards the traditional idea of politicians, Obama instead moved the Democratic election campaign away from its usual image of a ‘dogfight’ between politicians; instead, she adopted the persona of a ‘parent,’ thereby making the election campaign a much more individual and private issue. Such approach was particularly effective because it aroused empathy among the public, a ‘softer’ quality that the Clinton campaign often lacked. One of the things Obama successfully did in her speech was drawing a clear line separating the Republican campaign and the Democratic campaign. The key reason for success lay in the optimistic language she employed, a characteristic that was absent in the Republican campaign. The Democrat’s motto that she declared, “when they go low, we go high,” is the best example of how Obama used her language to assert the superiority of ‘hope’ that Democrats represent claims to represent compared to ‘fear and hatred’ that the Republicans allegedly sow in people’s minds. I am by no means a complete partisan for either Democratic Party or for Republican Party. However, it is difficult to ignore how some speakers are undeniably eloquent and more elegant in their portrayal of themselves. We need to remind ourselves that politics, albeit however difficult, must be kept as a place not where emotion prevails but where intellect and rational decisions dominate. Now, don’t get me wrong- I’m not suggesting that all candidates in US primary elections 2016 are demagogues trying to drive America to its doom. However, it is quite hard to ignore that populism has indeed made a comeback to US politics. But before we go on further, let’s define first what populism actually is. Over the course of history, there have been countless numbers of examples of populist movement, ranging from those crying for reforms to create a more egalitarian society to authoritarian politicians trying to use popular support as a medium to consolidate their own power. So it’s actually quite difficult to define populism exactly since its connotations can differ dramatically depending on the context. In a democratic sense, it is a movement that “seeks to defend the interest and maximize the power of ordinary citizens through reform.” (Britannica, 2013)  However, when tinted with an authoritarian colour, it is a movement that “revolves around a charismatic leader who appeals to and claims to embody the will of the people in order to consolidate his own power.” (Britannica, 2013) Simply put, it can either be defined as an effort to represent the will of the common people or a clever way to incite the public to support a demagogue. Nevertheless, there exist some common characteristics; in the vaguest sense, populism aims (or claims) to “champion the common people, usually by favorable contrast with the elites.” (Britannica, 2013) It is therefore most likely to arise in an era where the government (or the “elites”) is viewed by the public as corrupt and incompetent- which seems to be the widespread sentiment in the world today, especially in countries where social networking services empowered the voice of an individual to a previously unimaginable extent. Why is populism on the rise? In a way, it seems almost natural that populism should rise in an era where the individuals can actively discuss various problems of the society. These individuals, who previously lacked the platform from where they could gain enough public attention and support, are now thriving on the Internet where thousands if not millions of willing audiences can be accessed. In other words, one individual opinion can now influence political views of countless others; every issue in the most mundane daily lives can be politicized to incite support for a movement. Political actions are no longer so risky or difficult to commit, as a single post, with enough ‘likes,’ can have a major impact on the public opinion. In fact, Tom Hayes, Silicon Valley marketing executive, predicted that Facebook would replace Labor Unions in the future. This simple yet undeniably true quote from Robert W. Merry of The Washington Times sums up the ultimate reason why populism is once again waking from its long slumber in American politics. America is facing the worst economic crisis in seven decades (Kuhn, 2009)  and this makes it increasingly easy for populists to argue that it is time for a political reform so dramatic that those who represent the ‘establishment’ can’t do it. Although it is an oversimplification, this is what is happening in the American primary elections 2016. From both left and right sides of politics, radical statements are being made from ‘oddballs,’ and are attracting surprisingly widespread support. These oddballs are distinctively different from the other candidates in that they portray themselves as the ‘underdogs’ who are excluded from the ‘establishment’ and so can truly represent what the masses want. These ‘oddballs’ exist both in Democratic and Republican parties and exercise a similar yet slightly different form of populism. Conservative populism recently has taken a turn to resent the growing size of the government in the economy, especially the “cozy alignments between the government and other institutions.” (Merry, 2014) On the other hand, liberal populism is much more resentful of the wealthy top and regards the growing wealth gap between the rich and the poor as one of the biggest economic problems. Is populism bad? Nobody can answer that question in a definite way. It all depends on the context and what the real intention of the candidate is, which can never be fully known. It may well be a way of the people voicing their opinions that might otherwise be drowned out, but it may also be a chance for an ambitious but unqualified candidate to exploit people’s frustrations to rise to power. What is really important is for the electorate to try hard not to get swept up in the heat of emotion and always be aware that behind the mask of heroic rhetoric often exists a villain. 1: Munro, A. (2013). Populism. [online] Encyclopedia Britannica. Available at: http://global.britannica.com/topic/populism [Accessed 23 Apr. 2016]. 2: Merry, R. (2014). MERRY: the rising appeal of American populism. The Washington Times. [online] Available at: http://www.washingtontimes.com/news/2014/may/30/merry-the-rising-appeal-of-american-populism/ [Accessed 23 Apr. 2016]. 3: Kuhn, D. (2009). Today’s Populism Still an Echo of Past. [online] Real clear politics. Available at: http://www.realclearpolitics.com/articles/2009/03/todays_populism_still_an_echo.html [Accessed 23 Apr. 2016]. 4: Diamond, J. (2016). Trump: I could ‘shoot somebody and I wouldn’t lose voters’. CNN. [online] Available at: http://edition.cnn.com/2016/01/23/politics/donald-trump-shoot-somebody-support/ [Accessed 23 Apr. 2016]. Despite what the name might suggest, the South China Sea (SCS) is not actually owned by China. Under the Law of the Sea Convention, SCS is considered as ‘internationally owned territory’- basically, no one can boss people around in the sea. There is, however, a way to circumvent this law; if you own a piece of land, then a limited area of the ocean surrounding it can be claimed. This is why there’s so many countries fighting over two small chains of islands, Paracels and Spratlys. Although they are essentially just a bunch of rocks in the middle of the ocean, their location allows the ones who owns them to also own a large portion of the SCS as their exclusive economic zone. There are three main claimants that argue that they are the rightful owners: China, Vietnam and Philippines. However, China in particular has been developing an unusual attachment; not only is it claiming the largest portion, it’s doing so quite violently. One of the most significant event involved China and Vietnam, leaving more than 70 Vietnamese troops killed after engaging in a naval conflict over the Crescent group of Paracel islands on January 16th 1974. Another encounter between the two countries in 1988 was as equally unpleasant, ending up with 70 Vietnamese sailors dead and China finally achieving its goal of owning the ‘nine-dash line’. The international society was rudely reminded of the conflict when recently, in February 18th 2016, China deployed its missile defence system on Woody Island. The general concern is that the SCS is gradually becoming militarised, and this is enough to set the alarms blazing, especially considering that it is still a contested area with a number of claimants. US Secretary of State John F. Kerry solemnly warned that there will be a “very serious conversation” with Beijing. Now, the biggest question is: will there be another war? Considering the complexity of relationship between South East Asian nations, some may even think that the conflict might accelerate into a Third World War. Of course, it would be way too dramatic to assume that what happened in 1939 will happen again. After all, we are all far too aware of the disastrous consequences the war will bring- a war that might involve nuclear weapons. It is too risky for the whole of humanity to gamble over what is really only a speckle of islands. Yet, the debate remains; can the deployment of missile be seen as an act of militarisation, and therefore a military threat? Although China does not seem to think so, it is alone in asserting that the missiles mean no harm. What the Western world and the South-east Asian nations see is simply an image of strong Chinese military gradually bulking itself up to prey on the weaker nations. Even if China does not intend to actually exert its military power in the region, the fact that it is capable of doing so will intimidate the other nations claiming the islands and eventually silence them. Later, even the mere possibility of challenging the Chinese will become extremely slim for the South-east Asian nations; as is often the case in high schools, the bully will get his own way. Then why is US so unhappy with this development? Is it because of their burning desire to see the justice prevail in the world? I guess yes, partly that, but probably the main reason for its annoyance is in the fact that China is already very, very big threat to US hegemony in international affairs. Its incredibly fast economic development enabled it to rival the superpower, and with the ideological divide- well, no one can tell what might happen next. Will tension keep rising, but only in the limited region of South China Sea? Or will China’s tacit threat become a big enough spark in the peaceful pacific?